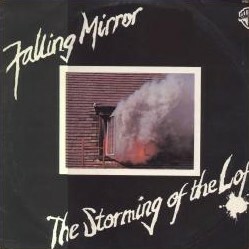 Falling Mirror always like putting a rock n’ roll number on their albums and on ‘The Storming Of The Loft’ it was called ‘Neutron Bop’. It’s a foot tapping tune that has a rock-a-billy beat and a few rocking guitar licks thrown in for good measure. Another feature is a ‘driving through an American desert’ harmonica. The chorus (which includes Tully McCully) echoes Nielen Marias’ vocals, repeating the last line of the first verse which all rhyme with bop. They then add a ‘Bop! Bop! to later verses whether they end in a ‘op’ sound or not. Those who prefer the more serious of Falling Mirror’s song will possibly not list this as a favourite as it is jaunty and fun filled, but it does show the breadth of talent that made up the group, allowing them to create rock masterpieces like ‘Johnny Calls The Chemist’ and ‘Makin Out With Granny’, but also opening the way for them to pay homage to a style of music they obviously have a soft spot for. ‘Neutron Bop’ does feel a bit too modern for it to sit completely comfortably with songs from Carl Perkins, early Elvis Presley and Bill Hailey but, I am sure, would have been favourably looked up by those luminaries if they had ever got to hear it.